For a delicious and inexpensive meal our Skate Wings are perfect for your dining pleasure. Our Skate Wings will satisfy all taste buds and still allow you to give your family and friends an affordable meal. For a delicious and inexpensive meal our Skate Wings are perfect for your dining pleasure. Skate Wings can be prepared numerous ways such as poached or grilled. A classic way to enjoy Skate Wings is with black butter sauce which gives it the ultimate flavor. Our Skate Wings are vacuumed packed to seal in freshness and then shipped directly to you from our facility. Bring something different to your next gathering for everyone to enjoy. Our Skate Wings will satisfy all taste buds and still allow you to give your family and friends an affordable meal. As a fresh pacific skate supplier we ship fresh and frozen pacific skate worldwide. 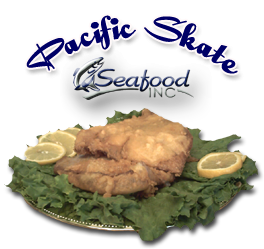 Seafood Inc is dedicated to superior quality of its frozen and fresh pacific skate.